Ready to write up a character of your very own, but aren't sure where to start? This guide will show you what you need to know when creating a character. Last edited by Knerd; 03-19-2014 at 10:32 PM. How you proceed is entirely up to you and where you would like your character to end up. There are some small differences between the two pages, but that will be discussed in a later post. ----> If you have already joined/created an RP and are trying to create a character specifically for that game, then you can do so through the RP's profile page. Click on the RP and then click on the Characters tab. There you will find the New Character button. Any character made here will be directly deposited into the roleplay. ----> If you have not yet joined an RP but wish to create a character for future use, then the Character Pool is your best bet. 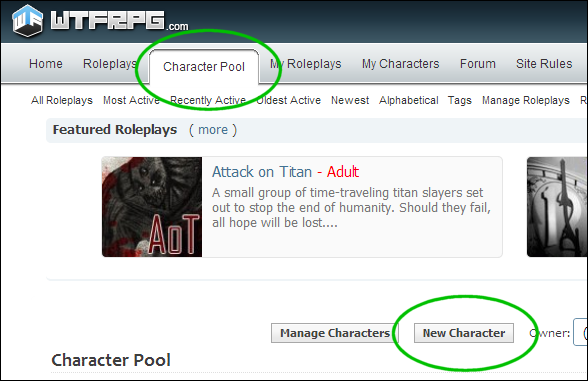 Click on the Character Pool tab at the top of your screen, then find the New Character button. Any character made here will be available for the future and can be added into a roleplay at a later date. Here's the fun part - Writing about your character! Not every section needs to be filled in, but make sure you give readers enough information about your character. Things like a name, photo and basic backstory are going to be necessary for most roleplays. Character Name - What is your character called? Character Avatar - A 100x100 pixel picture. This will identify you character in both the Character Pool and in a roleplay. Make it easily identifiable - Some people may skip over your character if they’re looking for a thumbnail that catches their eye. Synopsis - Your character, in brief. Use this as a hook. Something simple like “I like trouble” or “The jock with the heart of gold” will help people understand your character at a glance. Description - What does your character look like? Use this box for both text and pictures that illustrate your character. Some people may simply add in lists of adjectives that fit, while others will write a novel about how their character speaks, moves and smells. Fill in whatever suits you best! Personality - How does your character think, act and behave? Does your character laugh and joke a lot, but get sullen and withdrawn when the name of an enemy is mentioned? Do they spend time helping out orphans or whittling toy ducks for their mom? This is the place to tell us! Use your imagination and fill this box with text and photos that best demonstrate your character's personality traits. Equipment / Abilities - What do they bring to the table? This includes both their literal belongings and their significant talents. Everything from your character's ancient armor to their skill at playing poker can be listed here. History - Before the game started, who were they and what did they do? For anything else that doesn't fit, throw it into this section! Last edited by Knerd; 05-10-2014 at 12:02 AM. Rating - General or Adult? Is this character meant to be played in a rated-R adult oriented game, or is this character going to be family friendly? Choose your rating from the drop-down menu so that other users will the risks or benefits that come along with RPing that character. * Please keep in mind that only users in the Adult Content permissions group can participate in adult content/themed games. If you are 18 or older and allowed to participate in such things according to laws that affect you, you can change your permissions group by going to Settings and click on “Permissions Groups”. Genre - What style RP does this character participate in? Is your character intended for a fantasy realm? Do they fit better into a real world modern setting? Check off all the genres boxes that may apply. And if you're interested in a genre that isn't listed, just click on "Other"! Your character has been created, now set them free into the world! WTF's Character Pool allows you to create and manage characters that aren't currently being used in a roleplay. This is where you can brainstorm new ideas, try out characters, push yourself to develop new styles of characters, and see what everyone else is creating. You can have up to five characters in the Pool at a time. If someone likes your Character Pool bio, they’ll send you a PM to discuss it. To join the game with your Character Pool character, just return to the Character Pool. You can find your bios quickly by sorting by Owner, changing it to “You” - or by searching for your name or character. Once you’ve located your bio, click “Join Roleplay” and use the “Target Roleplay” section to type in the name of the game you wish to join. And if you've made a new RP and want to find other users to play it with you? Browse through the Character Pool for some people who would fit well in your game. When you find someone interesting, just hit the Invite button and write a message to the user! Include a link to your game and ask if they would like to join in. Once you're in a roleplay, you can actively play as your character! 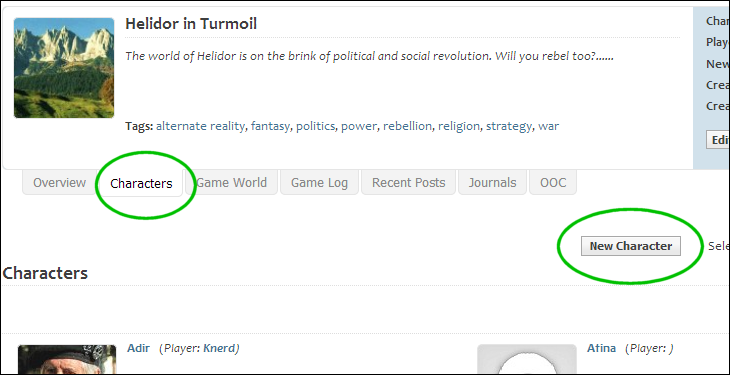 Just click to the main page of the RP, click on the Game Log tab and hit Make a Post. In addition to typing up a text post, you can choose your character from a list on the left side of the screen. This will ensure that everyone knows which character you're playing! Congratulations on your new character! So now you've got a character of your very own - Hooray! [Tagging Tips] - Using Tags wisely. [Tips to Gain Players] - How to successfully advertise your game. Last edited by Knerd; 03-19-2014 at 10:33 PM.